Would you believe that I spent all day yesterday thinking it was Wednesday? When I finally figured out that it wasn’t, I was elated to know that I still had time to work on my projects. That’s where the fickle finger of fate steps in and says, “oh no you di’n’t!” Lo and behold, a chunk of today was taken up with a trip to the doctor (me and all three kids) at which we discovered that K has an ear infection. Yes, again. Wouldn’t you want to get one of these in the mail? 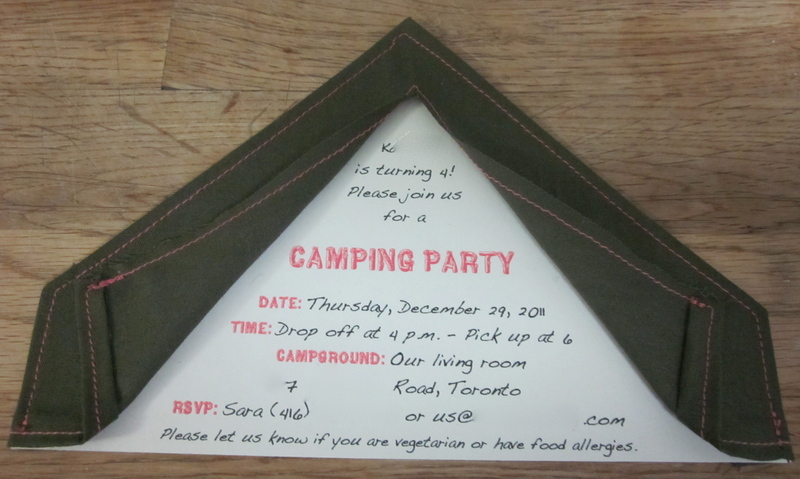 Yes, that’s a fabric tent stitched to a paper invitation. Yes, I designed and created these from scratch. Yes, this is over-the-top for a fourth birthday and yes, I probably could have used those six hours to do something else (like maybe sleep?). But designing and executing this kind of thing is my idea of major fun. Honestly, this is probably the most elaborate element of the party by far. Anyhow, they’re done and in the mail. True to form, I keep one on the table so that I can gaze proudly at it whenever I need a pick-me-up. I’ve done all but one of my email thank-yous, but the handwritten ones are still unwritten. Why is it so much easier for me to send thirty unique emails than to pen one note by hand? Anyhow, it needs to be done and it will be… as soon as K is back at school and R stops partying from 10 til 2 every night. As you may or may not know, K is the kind of kid who is constantly in motion. Not just regular motion, either, but jump-off-the-ottoman-onto-the-couch and climb-the-moulding-on-the-walls motion. She literally starts climbing the walls if she doesn’t get enough playground time. In light of this, I’m sure you understand why I’m fearful of the specter of wintertime cabin fever. I know, I know, I say often enough that there’s no bad weather, only the wrong clothing. The reality, though, is that it’s harder to ensure that we get out every day in the winter, especially with a tiny baby. And snow and ice, coupled with snowsuits, tend to reduce or eliminate climbing opportunities. Where am I going with this? Uncharacteristically, I’m going over-the-top. I’ve decided that we need some equipment in the house that will allow K and N to get their sillies out. Said equipment is now assembled and sitting in our basement. This week I hope to put down the foam flooring – coloured side up in the middle of the room, and grey side up around the edges so that I can use white duck tape to create a “road” for tricycles and toy cars. I also need to determine a good arrangement of equipment and furniture in the room. So that’s me. What did you do this week? You are amazing. Those cards are all kinds of awesome. I love that you keep one out to gaze at adoringly. I would (and do) do the same.